WASHINGTON — Who’s ready for the first real taste of fall? Well if you haven’t felt that autumn chill enough already, with the noticeably cooler mornings, then you’re in for a treat. This time of year, the average high is 69 degrees and the average overnight low is 51 degrees at Ronald Reagan Washington National Airport. As you may have noticed, temperatures have gradually dropped this week. Thursday and Friday will be near seasonable with temperatures in the mid to upper 60s. However, after a strong, moisture-starved cold front passes through the region midday Friday, a huge tumble in temperatures comes our way. Daytime highs on Saturday will only top out in the mid to upper 50s, thanks to a Canadian high pressure building into the region Friday night into Saturday. It will also be a little breezy on Saturday, which will make it feel much cooler. 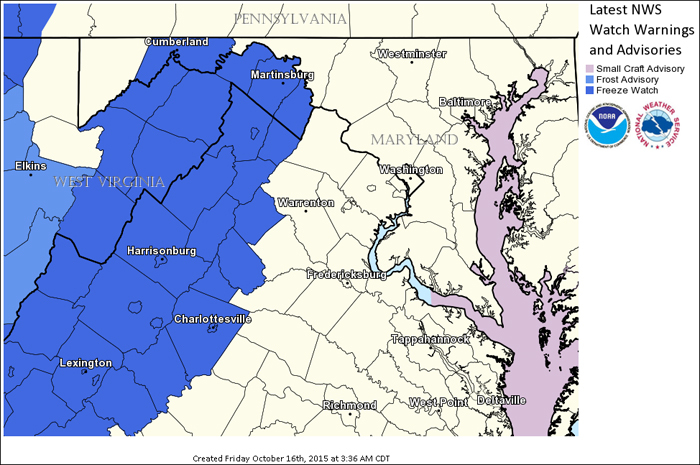 The National Weather Service has issued a freeze watch from late Saturday night through early Sunday morning for areas along Interstate 81 as overnight lows during that period will drop into the mid 20s to the low 30s. Unprotected vegetation sensitive to freezing temperatures will be killed or damaged as temperatures dip that low. Another freeze watch will be possible for Sunday night east of the Blue Ridge Mountains, and another chilly night is expected Sunday into Monday. Sunday’s daytime temperatures will top out anywhere from the upper 40s north and west of D.C. to the mid 50s around the District. There will be plenty of sunshine. But again the temperatures will feel more like November. So if you’re headed out over the weekend, just know it’ll be cool. Once the sun sets, temperatures will fall quickly. Sunday will be just a little cooler than Saturday, mainly because we will be off to a chilly start. Overnight lows on Saturday into Sunday will bottom out in the 30s for most locations. Overnight lows in D.C. will hit around 40 degrees. 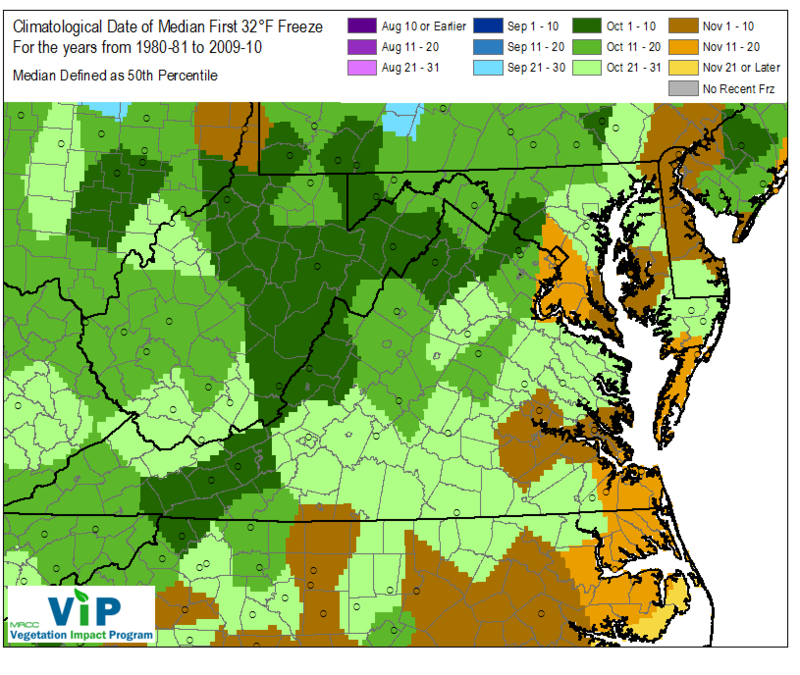 There will be a very good chance of a killing frost/freeze to end the growing season, especially west of D.C.
What exactly is the difference between “frost” and “freeze”? A freeze is when the surface air temperature is expected to be 32°F or below over a widespread area for a climatologically significant period of time. Use of the term is usually restricted to advective situations or to occasions when wind or other conditions prevent frost. “Killing” may be used during the growing season when the temperature is expected to be low enough for a sufficient duration to kill all but the hardiest herbaceous crops. Frost describes the formation of thin ice crystals on the ground or other surfaces in the form of scales, needles, feathers, or fans. Frost develops under conditions similar to dew, except the temperatures of the Earth’s surface and earthbound objects falls below 32°F. As with the term “freeze,” this condition is primarily significant during the growing season. If a frost period is sufficiently severe to end the growing season or delay its beginning, it is commonly referred to as a “killing frost.” Because frost is primarily an event that occurs as the result of radiational cooling, it frequently occurs with a thermometer level temperature in the mid-30s. There is a very good chance of temperatures slipping into the 30s overnight, which could warrant the first freeze warnings and frost advisories of the season, especially west of the District. By Sunday night, the same conditions resume with light winds and clear skies — ideal for radiational cooling (any heat that is gathered throughout the daytime lifts into the atmosphere under clear skies because there is no clouds to insulate us). So how do you protect your plants? Well, if there is a frost advisory for your county, make sure to cover up plants before the sun sets so that it can help retain heat near the plants. If a Freeze Warning/Watch is issued, there is little you can do to protect plants, unfortunately. If you are able, try to bring sensitive plants inside because the freeze will likely kill them (depending on the severity of the conditions). It is a good idea either way to bring potted plants inside. You can also cover your plants with fabric including bed sheets or burlap or even an inverted bucket or extra flower pot. I have also heard that if you water plants generously right before a freeze, it will act as an insulator and help keep them protected! Either way, get ready for some chilly conditions. Temperatures stay around 60 heading into early next week, but we do warm back up to more seasonable temperatures by midweek. The good news: It looks like we can expect a very sunny stretch of days all the way through next Wednesday.